Titleist Golf’s 917 drivers are setting the standard for complete performance off the tee by providing maximum distance and forgiveness with precise customisation which benefits dedicated golfers at every level of their game. 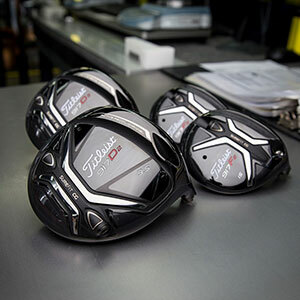 The new Titleist 917D2 and 917D3 models, engineered with proprietary Active Recoil Channel 2.0 and SureFit CG technology, are the result of an uncompromising “complete performance” design strategy employed by Titleist Golf Club R&D to develop the industry’s most comprehensive and efficient driver designs. They are already being played by some of the world’s best players, including Adam Scott, Bill Haas and Jimmy Walker. Dan Stone, Vice President of Titleist Golf Club R&D, said of the new releases: “When we talk to golfers about driver performance, distance and forgiveness are always paramount. But they aren’t the only attributes that players look for in a driver. They also want a repeatable trajectory, a shot shape they can count on for better accuracy. And they need it to look, sound and feel great. Titleist 917 drivers deliver increased golf ball speed for more distance with superior forgiveness, industry-leading adjustability with optimised trajectory control, and tour-inspired sound and feel. Active Recoil Channel (ARC) 2.0, is a long, wide, deep sole channel that actively flexes and recoils at impact to launch the golf ball off the face with higher speeds and lower spin for greater distances. Refined thickness areas throughout the channel – including thinner heel and toe regions – produce greater face flexibility for a more consistent deflection that reduces spin and increases speed across the face. Radial Speed Face 2.0, a high-speed forged face insert, is tuned with ARC 2.0 to promote greater off-centre ball speed for more overall distance. A precise, High-MOI Design, with a low and deep centre of gravity location, delivers stability and forgiveness by preserving off-centre ball speed for more distance, more often. Titleist’s industry-leading SureFit Hosel and new SureFit CG weight system deliver the ultimate in precision fitting for every player. The proprietary 16-setting SureFit Hosel allows golfers to set loft and lie independently to optimise ball flight for improved shot control and maximum distance. The Titleist Golf 917 drivers will be available at American Golf this autumn.